Thank you Marcus for sharing your knowledge of the Finnish axe! traditionalists alike. 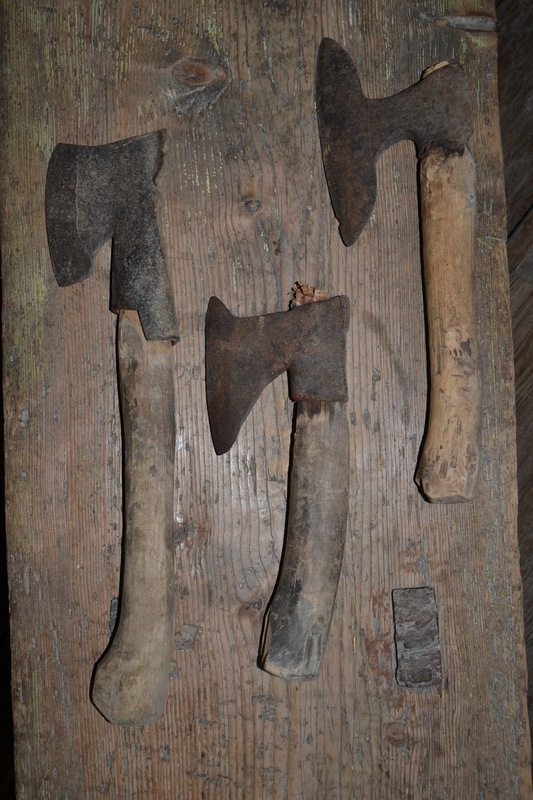 Long known and even iconic to most Finnish people, these axes seem a bit strange and exotic to the public outside of Finland. 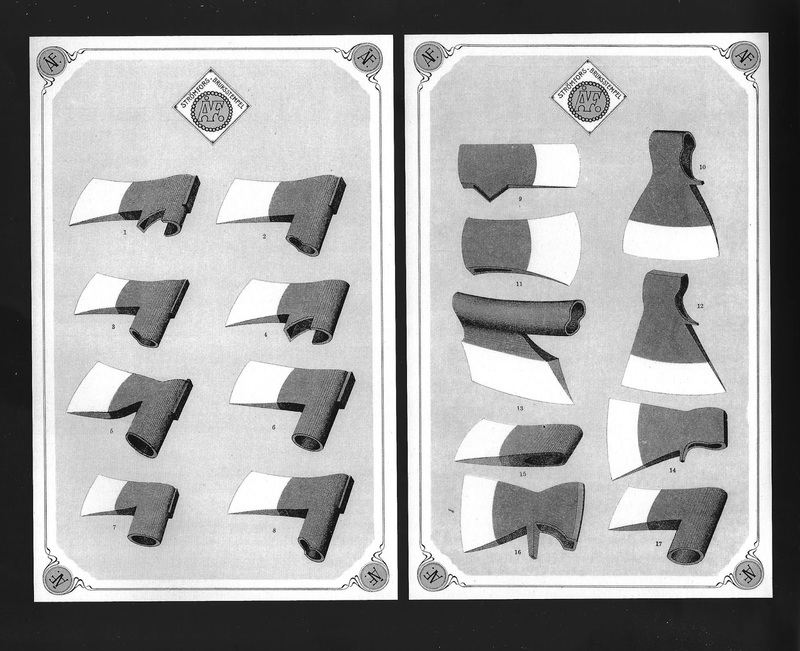 There is very little if any, written material about these axes in English, which explains why many non-Finns are a bit confused about all the different types of axes manufactured in Finland during the 19th and 20th centuries. There is no single Finnish axe type, but may axes made in Finland have similarities that were retained in some archaic features of the axes. These features will be further discussed in this article. Russian. Olaus Magnus, Historia de gentibus septentrionalibus 1555.
add durability as it increases the area of the shafted portion. East-European or Russian axes developed a “beard” to function in a similar way as a collar. The beard is an extended tip that grows out from the bottom part of the axe head, just at the eye and makes for a more durable shafting. The Karelian type axe has two beards. 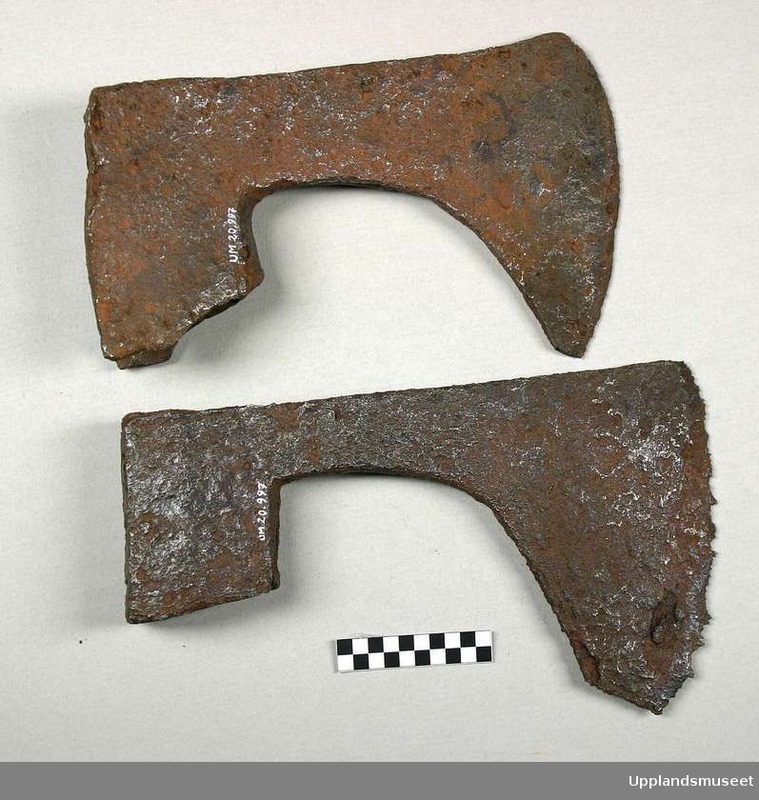 These “beards” are two similar extensions in the front and the back half of the axe head and this axe type is a middle form of the full collars European utility axe and the Russian axe. referred to as Bila (Swedish) or Piilu (Finnish). “Kalevalaseura – The Kalevala Society of Finland”. 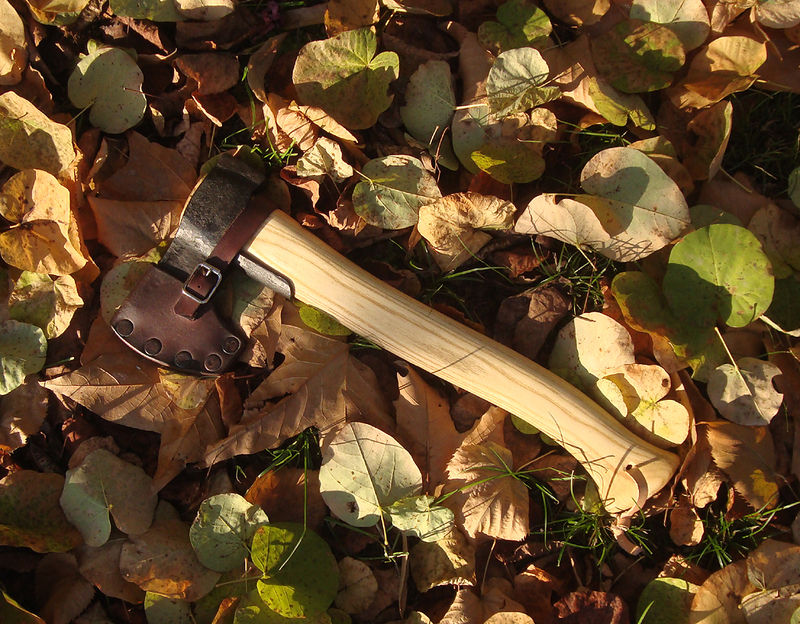 Collar-axes remained popular in Finland because there was a high demand on durability due to the versatility of axe usage. 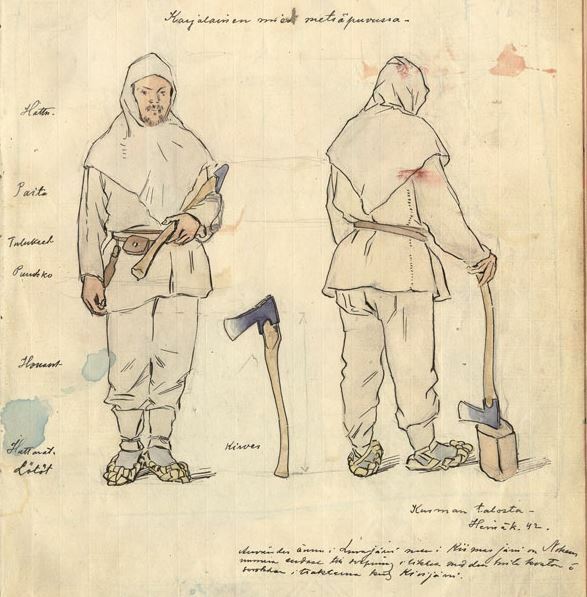 Most people in Finland could not afford to own a lot of axes, let alone carry all these axes with them to the field. One axe had to fit the bill and the axe was used for all things possible. The long collar made the axe more durable, and the handle fitted snugly inside the long collar. The wide edges of the Bila styled axes were preferred as this made it easier to carve logs for houses and they also proved efficient when cleaning branches of logs. developed by Finnish blacksmiths. UM20997, Upplandsmuseet. collar extending from the eye. Photo by Marcus Lepola. The overall size of axes remained fairly small until the 19th century due to the fact that iron was a valuable commodity and a good axe could be handed down from father to son. 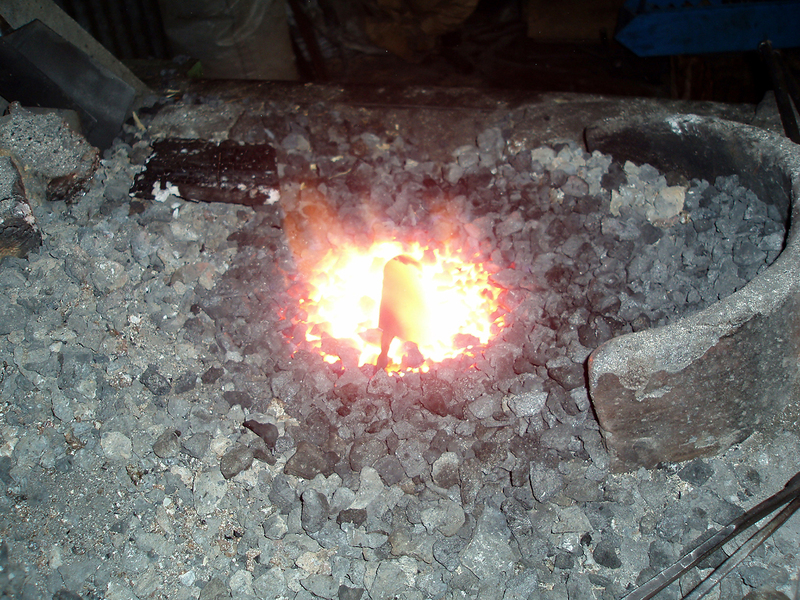 Traditionally iron was manufactured from iron ore found in the bottom of Finnish lakes and marshes. As industrially produced steel became available, this gradually increased the size of the axes. As mentioned earlier the collared axes were tremendously well developed for heavy use in the Finnish forests. 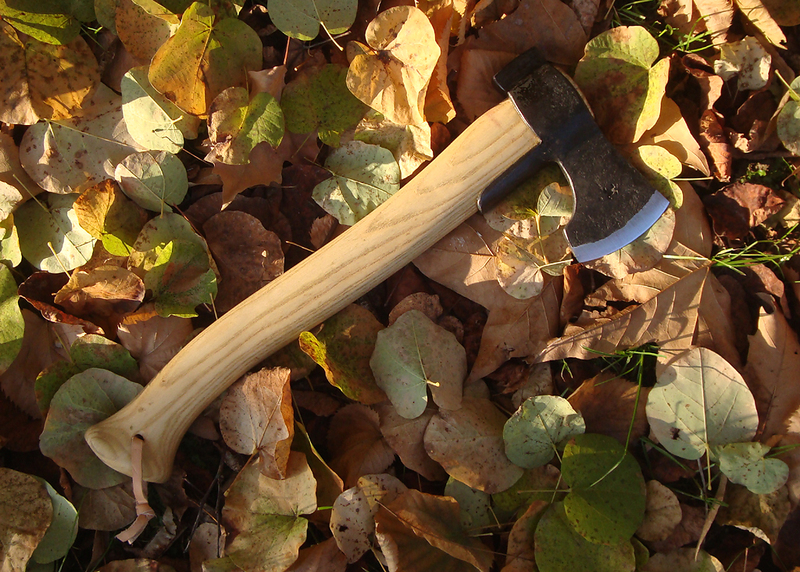 The axe was a virtual all-functional tool for the Finns, much like a “Swiss-army knife”. The axe could be used for a number of different things and was always carried along. The importance of the tool is evident in the way they were stored in the old days. The axes were kept in a rack above the main door so it would be readily available when venturing out. There is also another possible, superstitious reason, for keeping axes above the entrance to the cottages. Finns believed in all kinds of different supernatural forces such as ghosts, guardian spirits (haltia), trolls and such that could be dangerous if they were allowed to enter in to the houses. Sharp steel objects such as knives and axes were magically potent to deter unwanted spirit-beings from entering a home and hanging axes above the doors would be an effective way to keep them away. cottage at Pargas local history museum. Photo by Marcus Lepola. manufactured due to its versatility in felling trees. This type, called the Kemi or Hult ́s type, was also manufactured by Kellokoski-Mariefors, and labeled with the same model number 12. Kellokoski-Mariefors also had another, very similar axe, the Finspong, originally from Sweden. The Finspong is very similar to the Kemi type, but it has a wider edge. Curiously, the name Finspong is said to derive from Finns who were the first to settle the area. Finland was part of Sweden for some 700 years until 1809 and Finns, especially the Savo, migrated to the uninhabited parts of Northern Finland and worked their way down through Sweden and pioneered the establishment of new settlements. some forest and plant rye and turnips among the ashes for a few years. Additional food was provided through animal husbandry. Hunting, fishing and gathering were also important. This type of livelihood could only be maintained for a few years before locally available resources were spent and the household had to move. The Finns reached Sweden by the 17th century. The Swedes were worried that the Finns would burn down all the valuable timber needed for the ironworks and shipyards so they sent some of them away to Swedish colonies in Delaware in America to slash and burn in the woods inhabited by Indians. The Finns probably fit well in with the Native Americans as their most valued possessions in addition to the rye and turnips and the odd cow and dog was the knife, the axe, the bow and the spear. another with a W-stamp. The third one is unmarked. A Billnäs nr 7 is the second one from the top. The broad Russian style axe at the bottom is unusual as it is of Swedish manufacture, From Lunds bruk in Örebro. The standing axe is of unknown manufacture, probably an early Kellokoski. Photo by Marcus Lepola. sledges pulled by horses. It was not unusual for temperatures to fall well below -20 Celsius. In these conditions, wood dries and shrinks. Wood becomes more brittle and brash as it dries up and freezes. 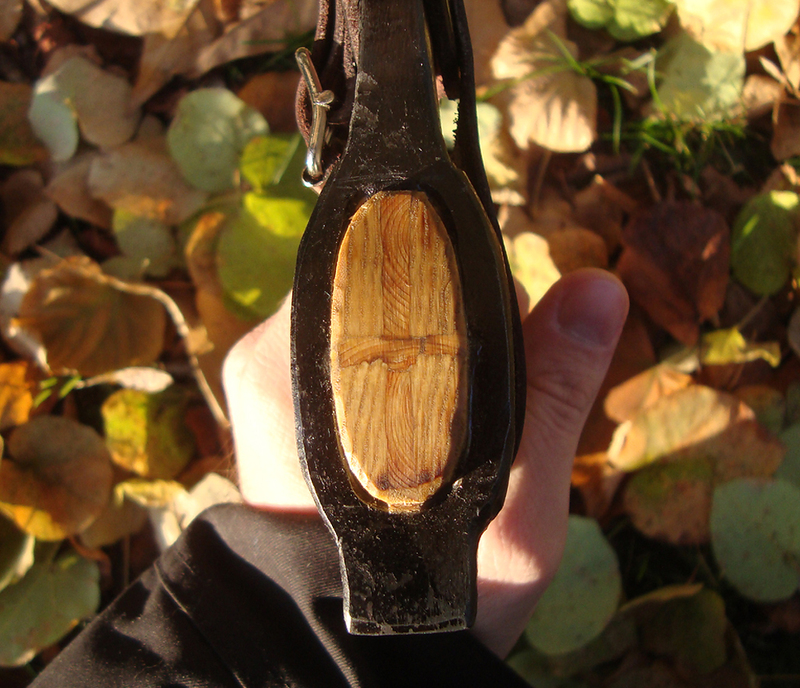 If the handle is fitted on a narrow axe the risk for breakage at the eye of the axe-head will dramatically increase, especially when twisting the axe sideways which is common when splitting trunks. 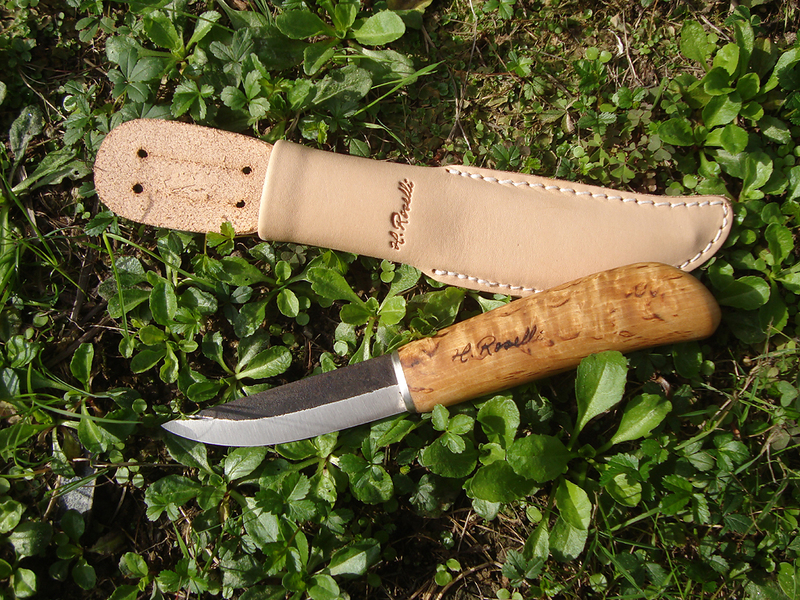 A long collar improves durability in these harsh conditions and gives a better grip of the wood. Additional tricks were used to make sure that the handle fitted snugly to the eye of the axe. 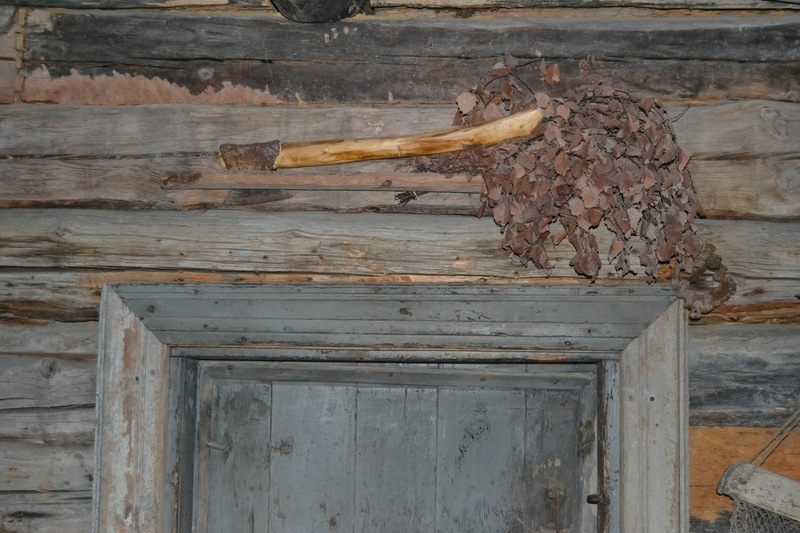 Tar and birch-bark were often added on the joint before shafting the head to improve the hold. 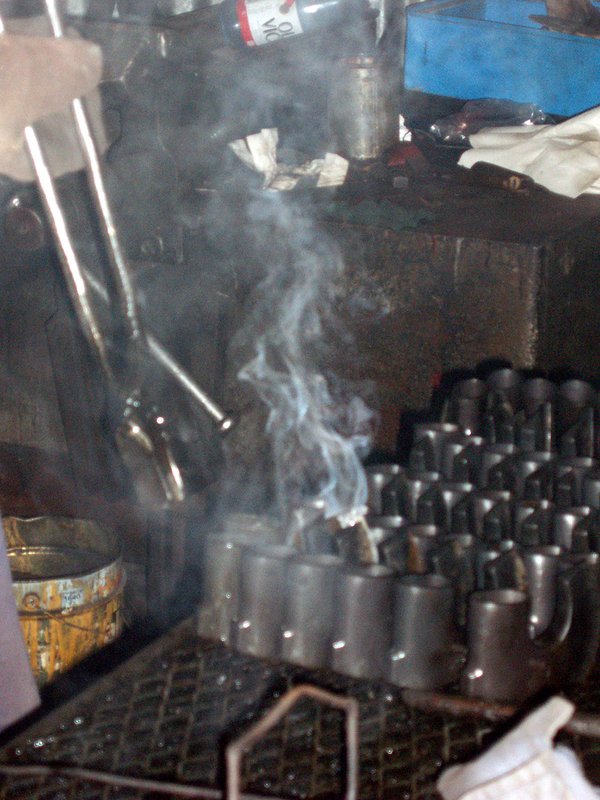 Boiling the head portion of the shaft in water before attaching the head is also an old trick that has been proven. Even if the wood swells up due to added moister content, the head will still go a bit further down over the softened shaft. The shaft was also developed to fit well in to the hand of the user, even when wearing thick gloves in cold winter conditions. 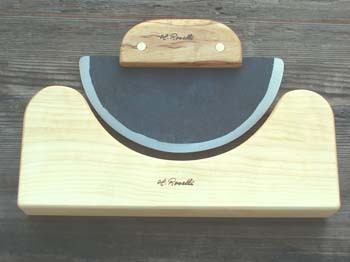 Axe handles would sometimes be roughed on the surface to provide additional grip for the user. It was common that the men using the axes would make the shafts themselves in accordance to personal preference. Wood and lumber did not hold a real value when standing as living trees in the forest. Trees had to be felled with axes to produce firewood, boards and hewn lumber. The only tools used were broad or true Bilas and axes. Crude waterpower sawmills came in to use in some parts of Finland in the 17th century but the handsaw did not find its way in to the toolkit of a Finnish lumberjack until the latter part of the 19th century. people. At best, some 500 000 people earned at least a part of their living from logging and forestry during the poor years in 1950. These are impressive figures considering that the population of Finland was 4 million at that time. the country going. 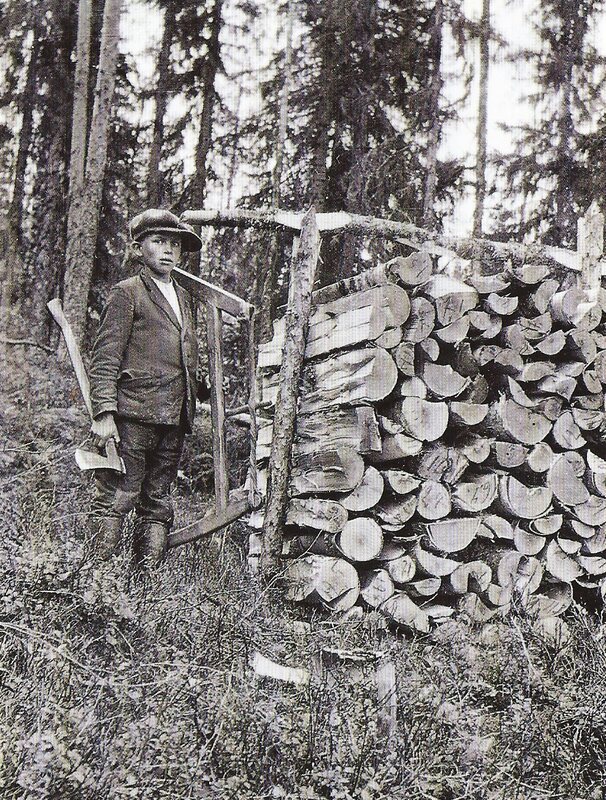 A young boy has finished cutting fire wood for the winter. Though job for anyone, let alone a young boy. Image from the Lusto Forest Museum. the axes produced by the forges in Finland relied mainly on established models, previously made by local smiths. 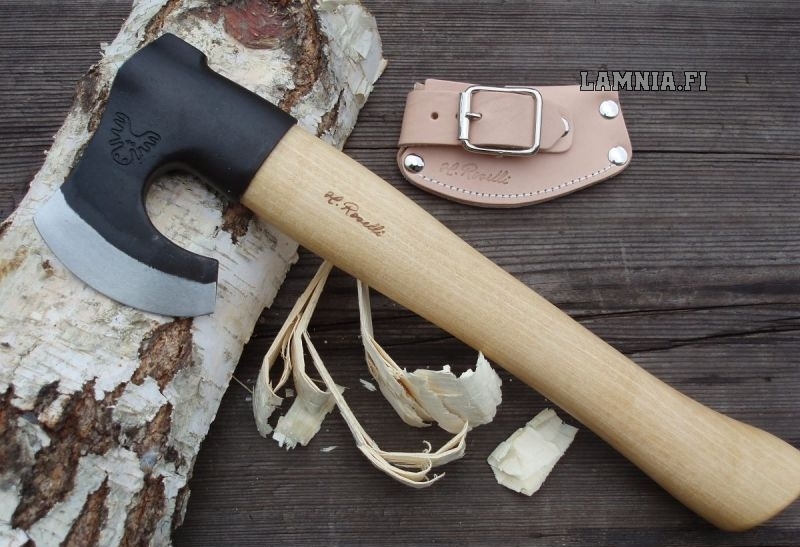 The Kemi and Finspong types were clearly the ones most suited for the old Finnish slash and burn farmers and not surprisingly, this model also became one of the most popular all around axes. trunk became more weathered and durable. The wood becomes very dark and heavy. The only problem with this method is that it took some 15-25 years before the hardened wood could be harvested. That is why fathers made sure to have a lot of processed trees at different stages around so that their sons and grandsons would have an ample stock of axe-handles when they needed them. Also distinct handle models were passed down in family lineages from fathers to sons. axe-handles made by the soldiers at the front to the people back home. splitting axes the handle should be 10cm longer. In felling and chopping a long handle transmits more power but it less accurate. If the handle is too short it will strain the back of the worker as he is forced to work in a bent over posture. reach the second joint of the middle finger. A splitting axe handle should reach the palm of the hand. A good handle has a downward bend, the lower grip portion should be well defined and the pommel nob should be wide and round. handles were true works of art and perfectly shaped, tapered and balanced. man who took all day to make an axe handle was also ridiculed as “worthless”. 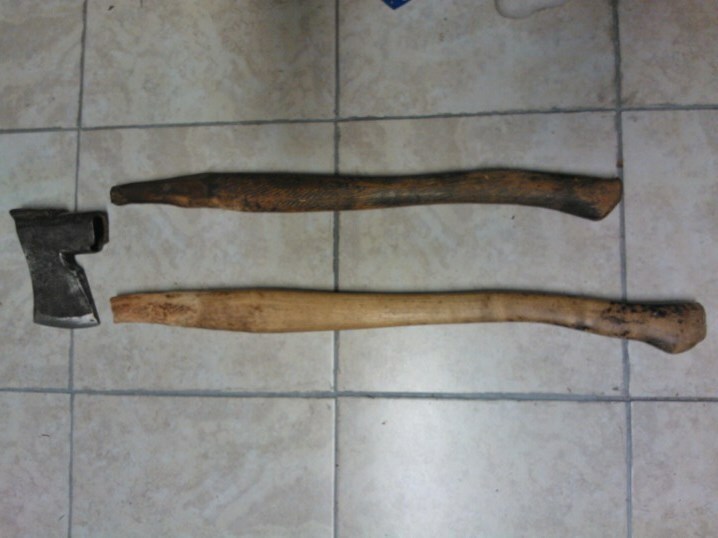 Old axe handles and a Billnäs 12:2 axe head. Photo by Marcus Lepola. temperatures. The traditional birch handles had been proven unbeatable. important tool for cutting down timber as old type of saws were unreliable. Finnish lumberjacks also preferred an axe that was well suited for splitting large chunks of wood. The blade of the axe had to be slim and wedge-like so it would penetrate deep in to the wood. It should also be heavy and durable so it could be wedged deeper in to the wood with another axe to aid splitting. The axe was also used for a number of other things, such as banging bears on the head during winter hunts but that is a different story. 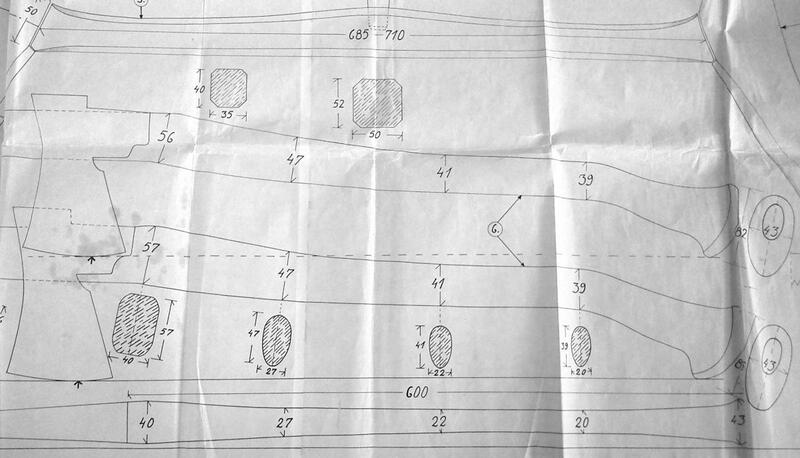 Blueprint of a Finnish axe-handle. century. Blacksmiths were important members of rural agricultural communities as their services were necessary to maintain and produce the tools necessary for everyday life. Blacksmiths started to specialize in the manufacture of certain products as early as the 16th century, such as gunsmiths, knife-smiths and axe-smiths. As axes were made locally there was a great deal of variation in axe models. received its final name in 1744. Kellokoski-Mariefors Ironworks was established in 1795. Several other forges and ironworks were also established in Finland during the 18th century such as the Dalsbruk Ironworks and a similar one in Björkboda. Ironworks were also established in Ostrobothnia such as the Kimo ironworks during the early part of the 18th century. 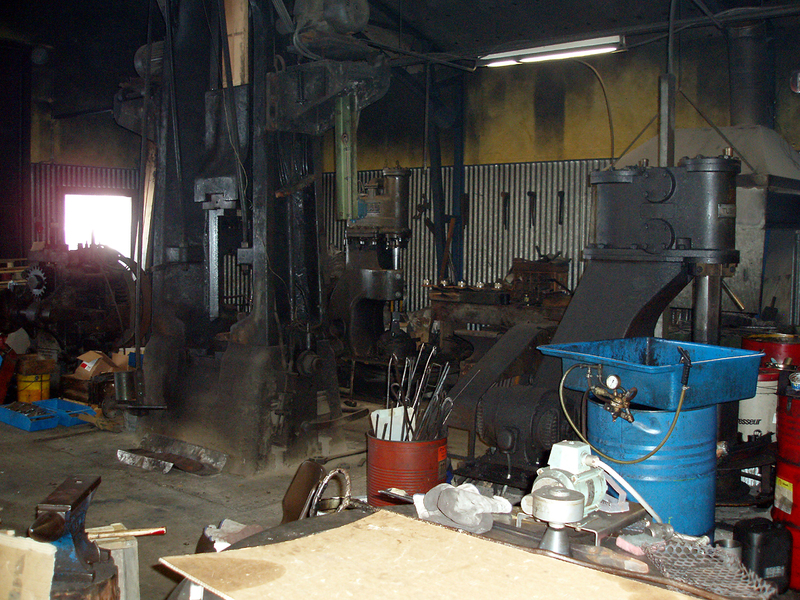 Billnäs ironworks. Photo by Marcus Lepola. 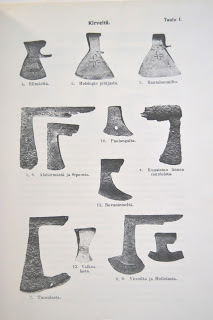 However axes produced by these ironworks were not standardized until the end of the 19th century when only Billnäs, Kellokoski-Mariefors and Strömfors remained as main manufacturers of axes. 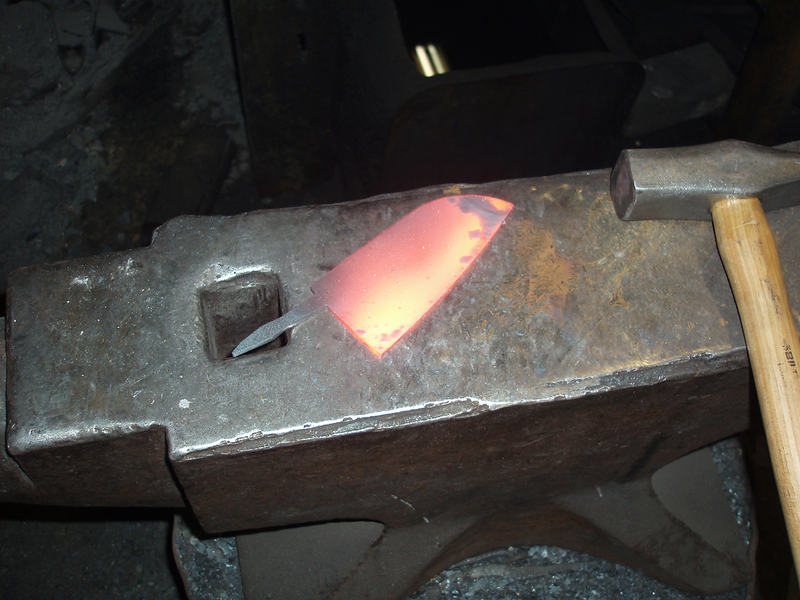 It is interesting to note that among the first axes produced at the Billnäs ironworks was a halberd- or a battle-axe. 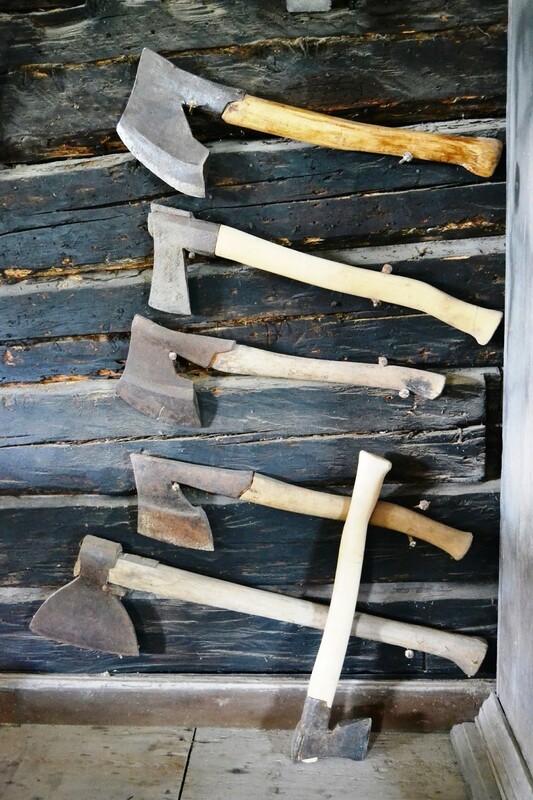 These axes were made to arm the Swedish troops fighting in the 30-year war in mainland Europe. century as Finland, then part of Russia, was able to increase the export of axes and other steel implements to Russia as import taxation of Finnish products ended in 1835. 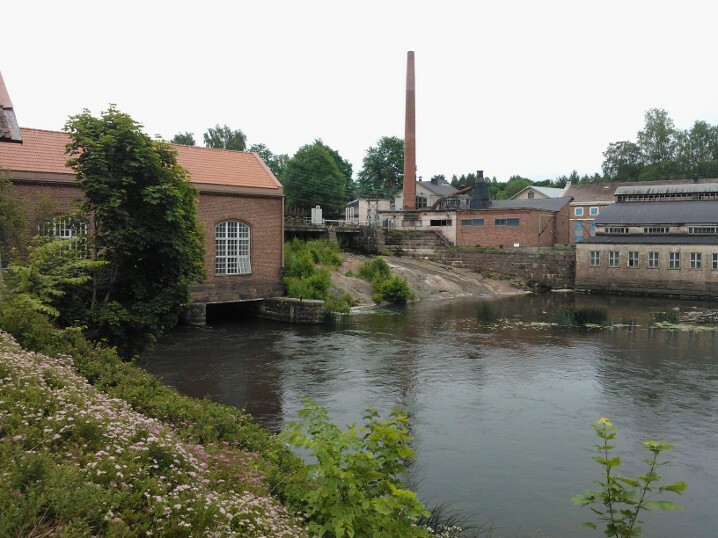 The production of axes at Billnäs grew with 500% by 1880. 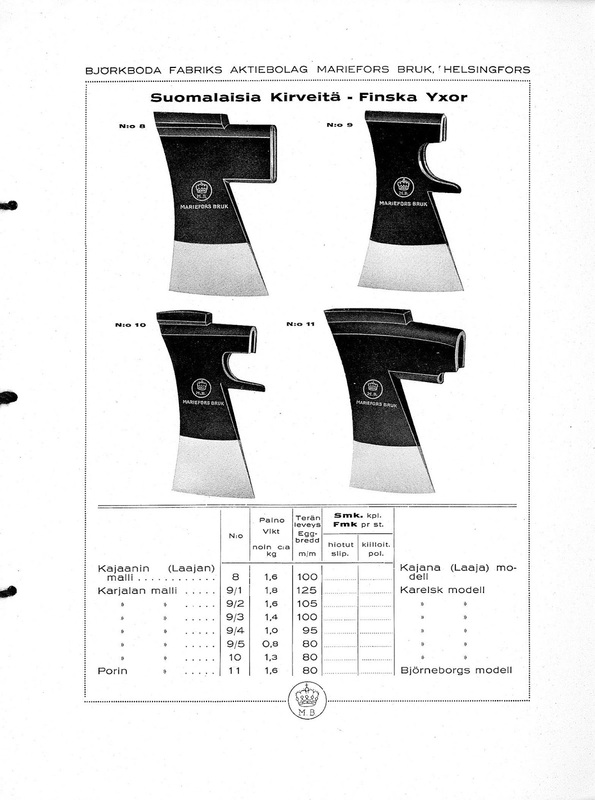 Also the availability of American and British axes forced the Finnish ironworks to step up their production. At Billnäs the owners followed the example of Swedish ironworks, which at the time were highly industrialized. Up until then the smiths at Billnäs had made axes and other utensils using the same methods as any other village blacksmiths for some 200 years. As of 1888 onward axes were made using American machine-hammers and by the end of the 19th century the factory could produce as much as 2000 axes per day. 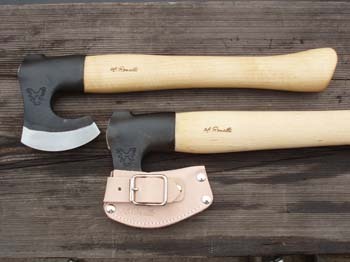 Finnish style axes manufactured by the Kellokoski-Mariefors ironworks. Models 9 and 10 are the Karelian type. with Billnäs or even Kellokoski-Mariefors. The models they made were identical with the other forges, except for the model 2 which was only made by Strömfors and was modeled after the Viborg style axe. The models 15, 11 and 9 are considered “American” axes. the axe to aid splitting is not possible as this will shatter the axe. 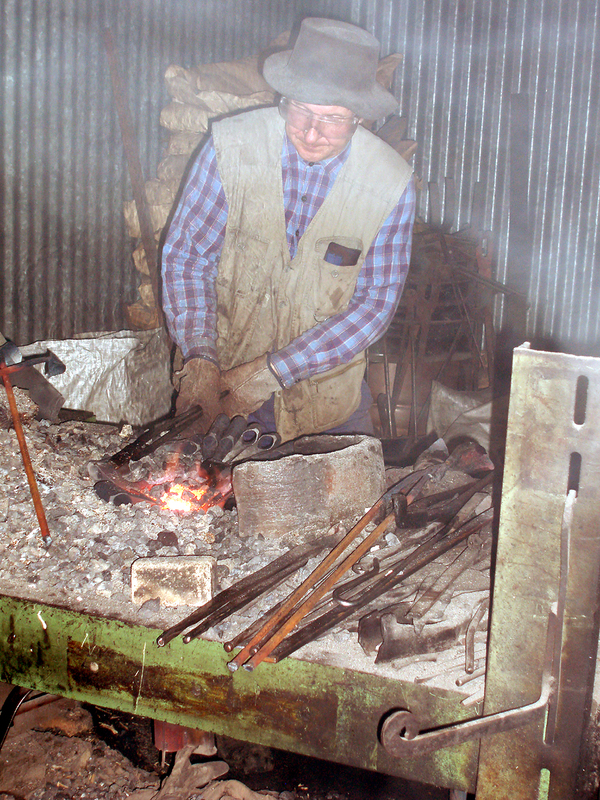 traditional axes such as the axes of the Gränsfors forge. The truth of the matter is that never before have so many high quality axes been available for the public. The irony is that most of these axes are used in a recreational context. This means that most users will only need the axes for splitting fire wood, cutting saplings and some carving. This is completely understandable as cutting live wood is prohibited in most hiking areas in Europe, and even North America, so very few people will ever use the axe to the same extent as an old Finnish lumberjack/slash and burn farmer who is cutting down huge pines one day, building a fence of split trunks the next day and hewing and cutting out joints for a wooden cottage on the third day – all with the same axe. 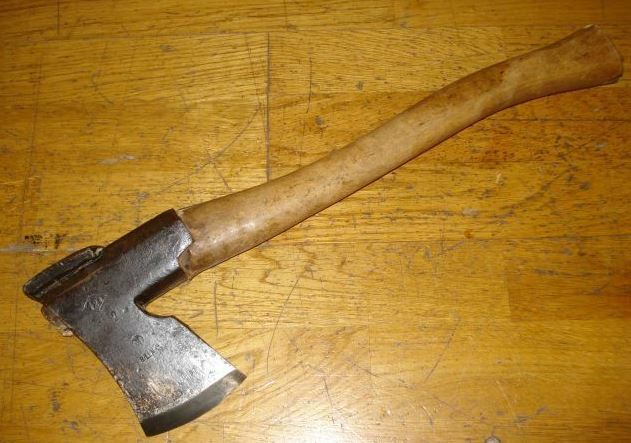 Luckily there are some old documentary clips made by Finnish ethnographers of some oldtimers making use of the axe in a very versatile manner. 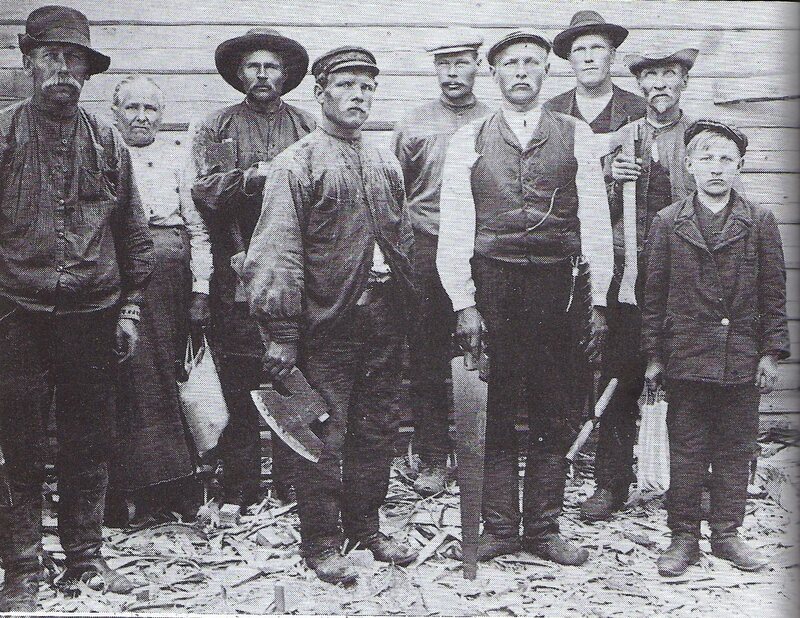 These men were using axes as young children and learned the craft gradually over a period of several decades. Their skill is evident in the way the effortlessly use the axe for carving and chopping. These documented skills are an inspiration to anyone interested in learning and preserving old carpentry techniques. of the famous Kemi axe. All material copyright by Marcus Lepola 2013. Here is a very nice contemporary Finnish axe made by Pasi Hurttila. The head is forged from a single piece of spring steel and the handle is made of ash. The neck protection is iron, welded to the steel head. Photos are courtesy of Federico Buldrini. Maasola, Juha: Kirves. Helsinki: Maahenki, 2009. 1936-1939. He filmed five films in total of different Finnish traditional crafts, games, fishing etc. 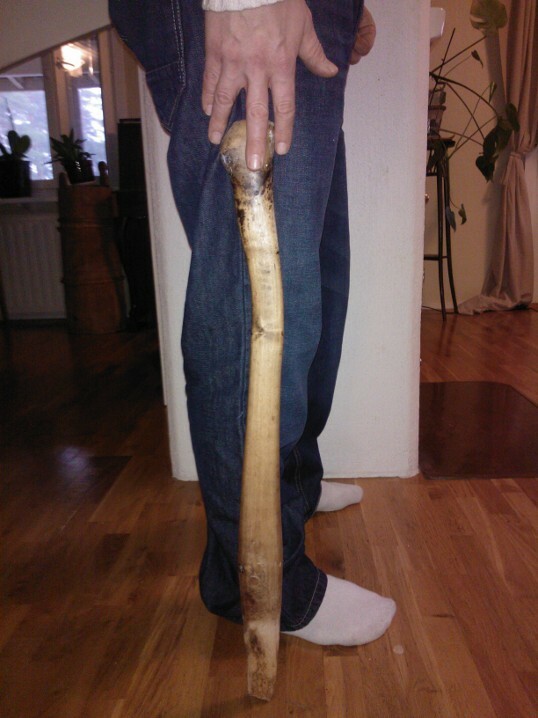 The man making the axe-handle is Iivari Mattila from Renko, Finland. He was 80 years old at the time and he was also referred to as “The old man (äijä)from Rauhaniemen. The same series as above, this time showing how a split stave fence was made using axes. 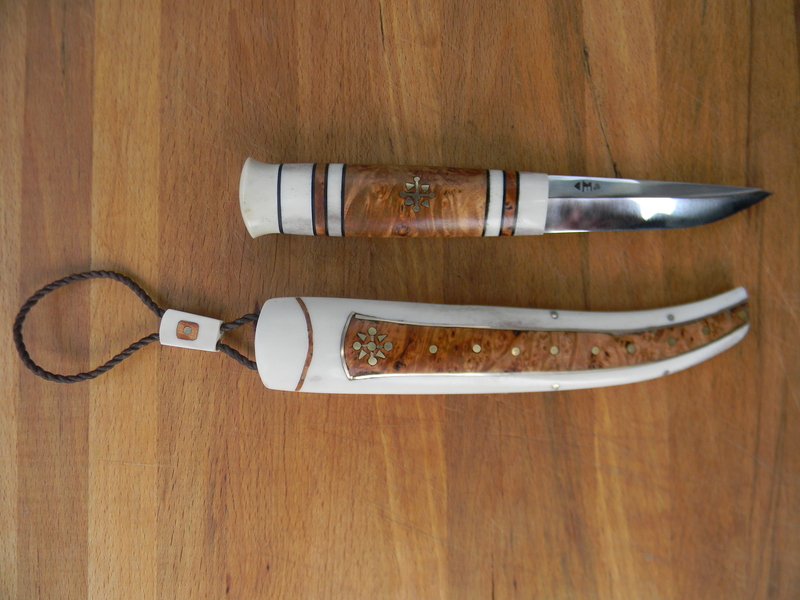 Finnish home front from 1942, wood cutting and axe handle making. Ray Mears choosing and using an axe. 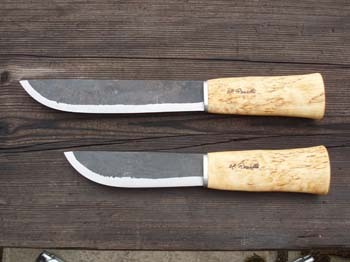 H. Roselli knives are made in Harmoinen, Finland at the workshop founded by bladesmith Heimo Roselli. A self taught smith, Heimo started forging in 1974 and since 1976 he has been making knives full time. 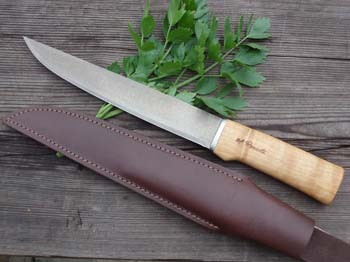 Roselli makes a simple, unique and great looking knife using carbon steel blades, curly birch handles and leather sheaths. 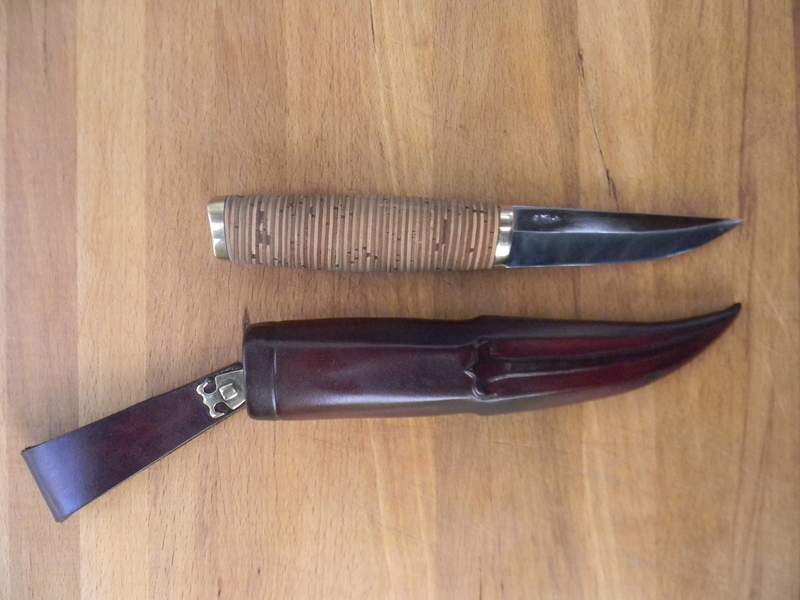 The knives and sheaths are without embellishments and are definitely meant to be put to work. The blades are made from Krupp W75 steel with a carbon content of 0.7% to 0.8% hardened to HRC 59 – 62. 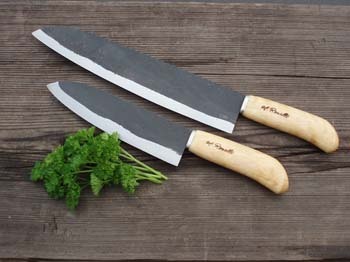 Roselli also uses ultra high carbon steel in a series of knives that have a carbon content of 1.5% to 2.0% and are hardened to HRC of 64 – 66. A specialized worker flattens the steel with rollers and stamps it in dies to the raw blade shapes; then Roselli himself forges the bevels, does the heat treatment, sharpens and finish all the blades . 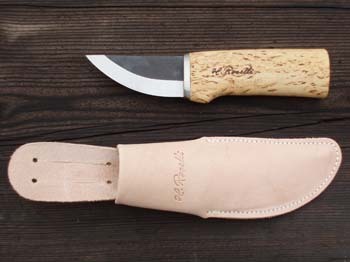 The handles and sheath are all hand made within the Roselli workshop by few craftsmen. 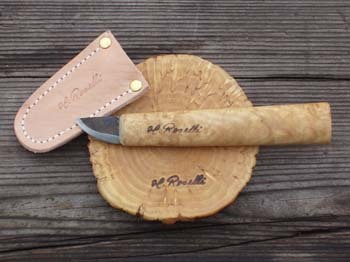 Roselli Oy also produces a line of culinary knives and a traditional style Finnish axe and hatchet. 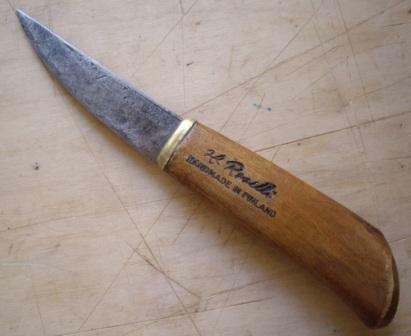 “The Roselli nikkarinpuukko has the most classical puukko shape.The hooked pommeled handles became popular in Finland during the 30s and they can be seen extensively from the first Marttiinis to the many Kauhava made puukkos. This Roselli takes the concept and put it to its simplest version. 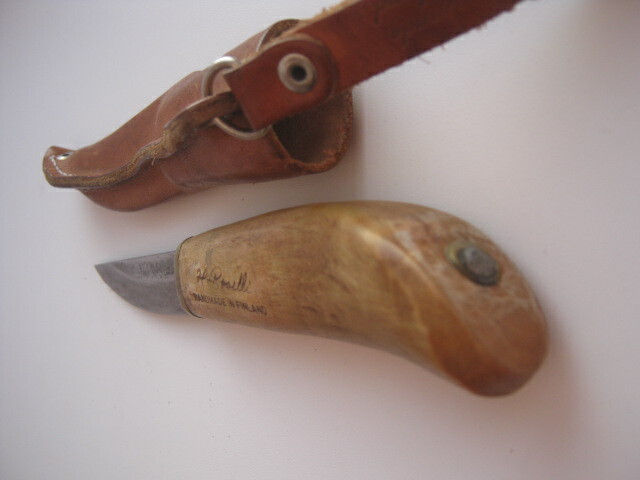 During the 80s and 90s the model shifted from a more pronounced pommel, a peened blade and a back sewn sheath to a more gentle curved handle, a totally hidden tang blade and side sewed sheath. 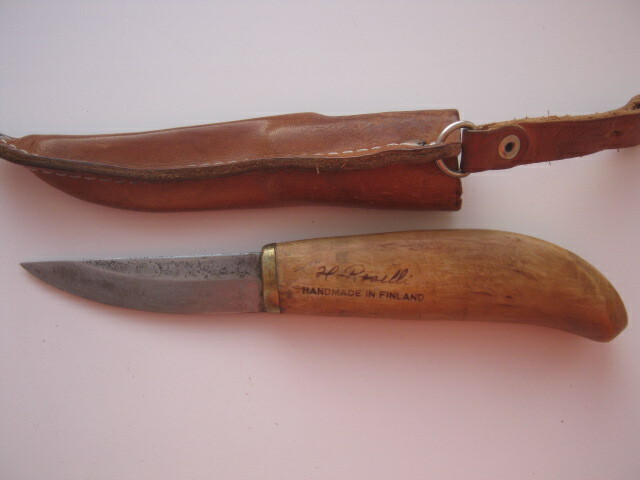 The pictures of the transition model comes from a discussion on the rusknife.com forum, posted by a member nicknamed ‘Lahti’ “. “The blade is forged from Krupp W75 carbon steel, a German equivalent to American 1080, tempered to a final hardness of 59-62 HRC. The bevels are flat, even, and ground to zero so to have a 18 degree edge. 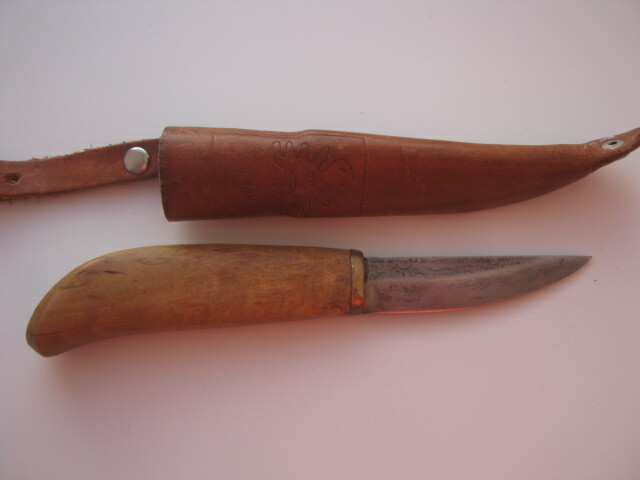 This specimen isn’t air popping sharp, but more than adequate for wood working Avoiding air popping sharpness is also reasonable since it wouldn’t last long in carving. Good biting and very easy to control. All in all the blade measures 86x21x3,2 mm, with a 60 mm tang. The handle is crafted from curly birch, the bolster that used to be of brass is now of nickel silver. We have a good blade-bolster junction and a good finish to the wood, coated with oil. The cross section is rectangular with rounded off corners. 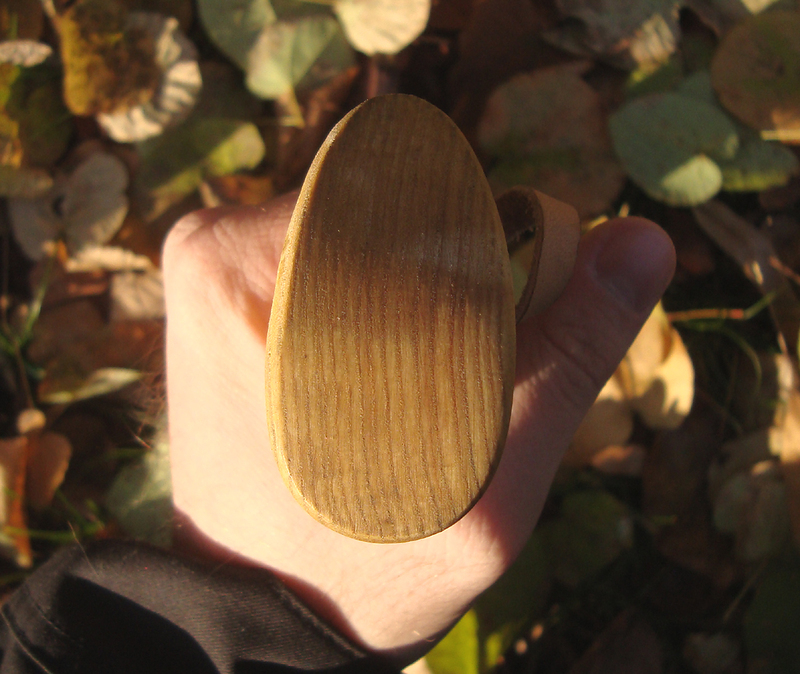 Even if somebody may find it less comfortable than the usual teardrop section found on puukkos it avoids the handle from turning during work and by any means fills well a mid sized hand. No hot spots have been detected. It’s 113 mm long, widens from 23 to 30 mm and thickens from 13 to 23 mm. 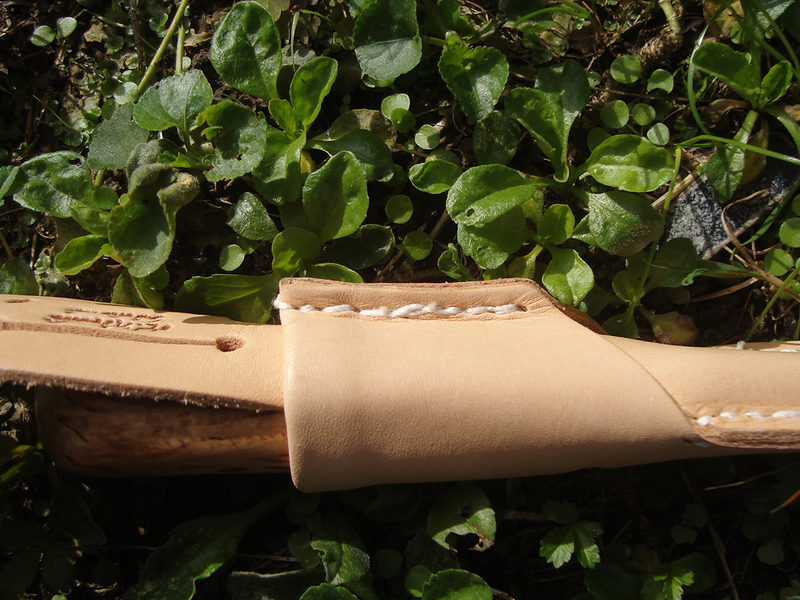 The sheath is a simplified version of a back stitched one. Two sheets of 2 mm leather, one making the back and the belt loop, and one making the front, stitched for few cm. on the back so to permit also an hypothetical horizontal carry, that I anyway see out of its place. Inside there is a plastic liner, just folded on itself. The slotted belt loop is the easiest to make and holds small belts. Thanks to its smallness it isn’t particularly annoying while sitting. 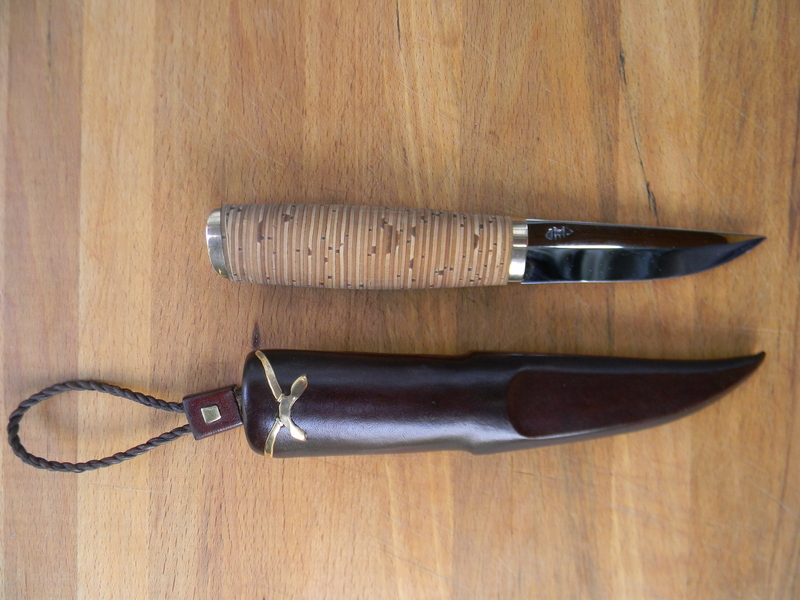 A very handy puukko, born for woodcarving and ruling it. A good step forward from mass produced knives and ideal if searching for a higher quality and strong charactered puukko without spending the funds for a fully custom made one. 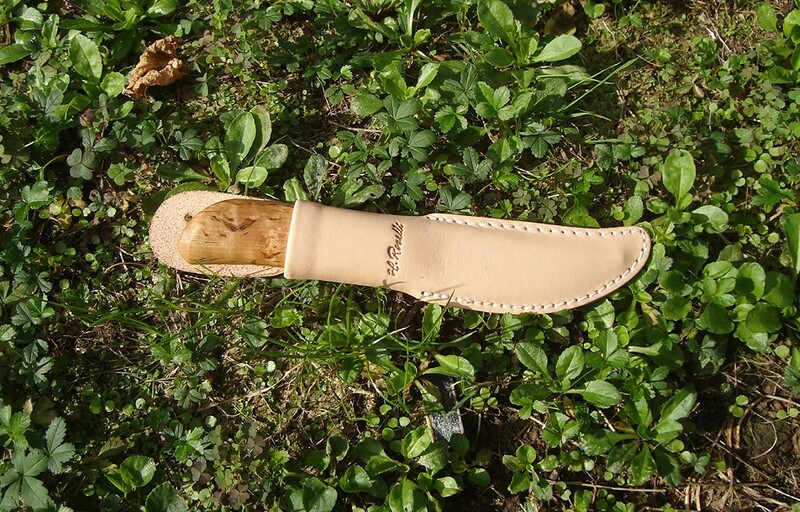 Please visit Mihail Pinhasov’s site at http://www.lamnia.fi/index.php?lang=en an excellent source for all kinds of knives and other gear. 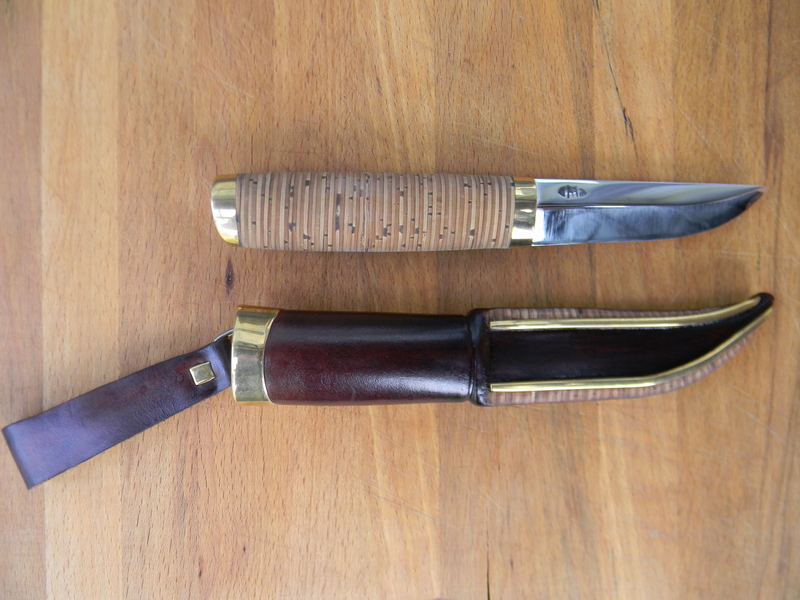 The Carpenter Knife shown with two other knives for comparison. A small Kauhavan Puukkopaja yleispuukko and a 2011 made Pasi Hurttila vuolupuukko. Here are the measurements for comparison. Thank you to Mihail Pinhasov and Heimo Roselli for information for this article and a special thank you to Federico Buldrini for his hard work and dedication. 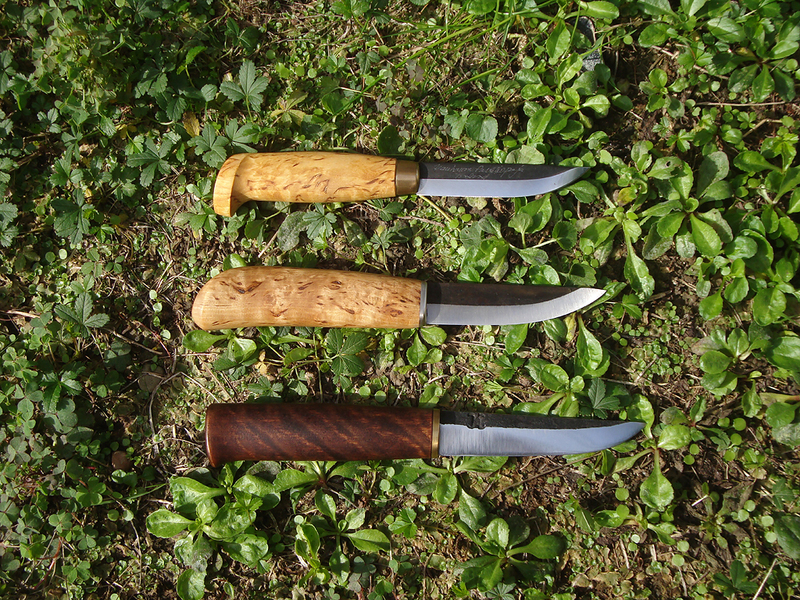 I just received photos from Markku Parkkinen of some of his recent work, four beautiful knives shown below. Thank you Markku for showing us your work! 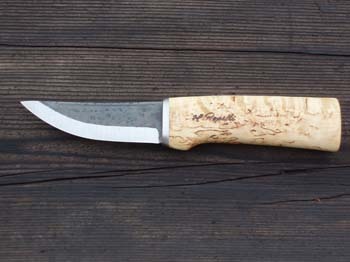 Markku: “The Lapland knife is made of bronze, reindeer antler and root burl of goat willow tree. The blade is Böhler k510.